Ever since the start of Inertia, Reza and Alexis have stated their intention to do their best to help the scene and not just their own band. The creation of their own label, Cryonica, was a massive step in that direction and now they're branching out even further with the Virus shows. The intention is to showcase some of the best acts in the scene and this, the first of hopefully many, did just that, with two of the leading lights of the futurepop scene headlining, ably supported by one of the most promising new acts, Swarf. Due to a lack of organisation at the door, which unfortunately showed the Underworld isn't quite up to the task of putting on such a popular show, Swarf had already started when I got in. But, that aside, they put on a really great show, a mix of dancey futurepop sounds and Liz's stunning vocals. Visually, Liz's full on cybergoth look made her the centre of attention, with her multi-coloured hair extensions flying, while Andrew and Chris tended more towards the typical synthpop style performance concentrating on the machinery in front of them. I must say, though, while Liz looked and sounded great, her dancing leaves a lot to be desired! There was great interaction with the crowd, with friends and family at the front of the stage, and Liz coming under a hail of knickers. The sound threatened to come a cropper when they tried a brand new track, 'Supine' (explained as a girl called Sue in a Pine tree), but after a few presumably unintentionally strange noises were heard, the whole thing got back on track, leading up to the triumphant closer, 'Drown' that left the crowd wanting more. A wait in the ridiculously long cloakroom queue came next, before Assemblage 23 took the stage. Last time they played London, it was as a two-piece, but this time they included a drummer who added to the visual element of the live show. An A23 performance can be a somewhat patchy thing, with over-wordy songs that sound great on CD falling a little flat live. This was especially true of the slow, Depeche Mode-esque 'Cocoon'. However, the front of the crowd enjoyed the whole thing and Tom Shear really seemed to be getting a great buzz out of it. Things picked up nicely around half way through, and from then on it wasn't just the front of the crowd that was dancing. Dancier tracks like 'Disappoint', 'Document', 'I am the rain' and 'Let me be your armour', with pounding beats and full-on hands in the air dancefloor intensity, almost lifted the roof. They were called back for one encore as time was tight, and played 'Purgatory' from the first album, which was a little disappointing as I was hoping for 'House of fire', my fav A23 track. But, all in all, it finished on a very high note, Tom seemed particularly thrilled at the reaction, and following it was not an enviable task. Thankfully, though, Icon of Coil were more than ready to do just that and from the moment the beats started pounding, the people started dancing and didn't stop. The band seems to have toughened up somewhat since last time they played, the beats are more intense, their ravey sound just bigger and a raw edge to Andy's vocals (whose hair's a bit longer as well). They played 'Access and Amplify' as their third track and the place went completely nuts, but they were well able to follow it with comparative ease with dancefloor killers like 'Regret' and 'Confront'. 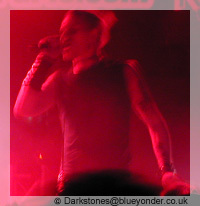 Unlike A23, when IoC slowed things down a little for a couple of more EBM style tracks, the momentum was enough to carry the crowd with them and they definitely seemed to feed of the enthusiasm clearly on display in front of them. The whole thing blurs into one long, arms in the air, dancing session in recollection, the cramped space in Underworld gave the gig the feel of an old school rave. They did leave the stage at one point, but didn't stay away for too long before coming back for an encore. The biggest treat was left until the very end, when they managed to squeeze a few more minutes into their deadline to play their now traditional UK show closer, Front 242's 'Headhunter'. 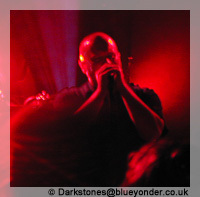 On it's own, their version is great, but they were joined onstage by Tom Shear, who helped out with the vocals, and VNV Nation's Mark Jackson, who spent most of his time jumping around the stage and grabbing people in headlocks! It was a great show and a credit to Cryonica, the only problem they have now is how the hell they're going to do as well next time. And, if the next Virus is to be anywhere near as popular as this was, a bigger venue is called for. The new Sordid discussion forum is here, just click on the text above.